So I Wrote a Book! | Live. Learn. Love. Eat. So I Wrote a Book! 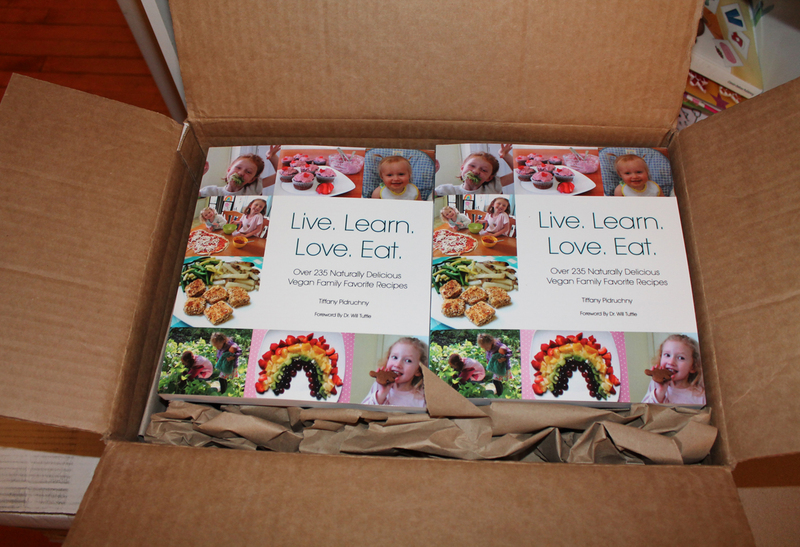 Today I hold a copy of my very own cookbook, Live. Learn. Love. Eat. 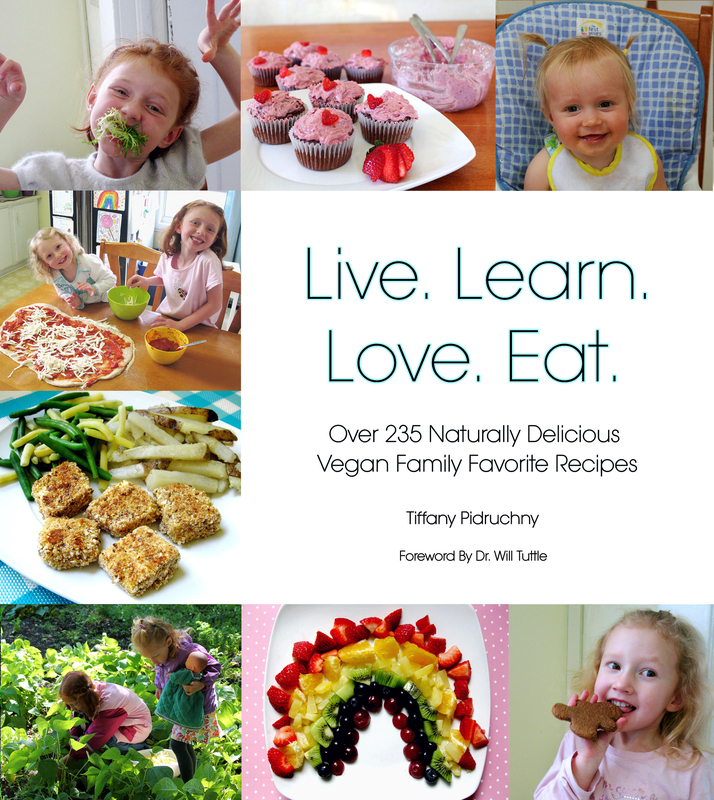 : Over 235 Naturally Delicious Vegan Family Favorite Recipes. It has been quite a long journey creating this recipe book while raising three little ones, but I am so glad to finally be able to share my kitchen creations with you in print, as well as have a copy of my own in the kitchen! 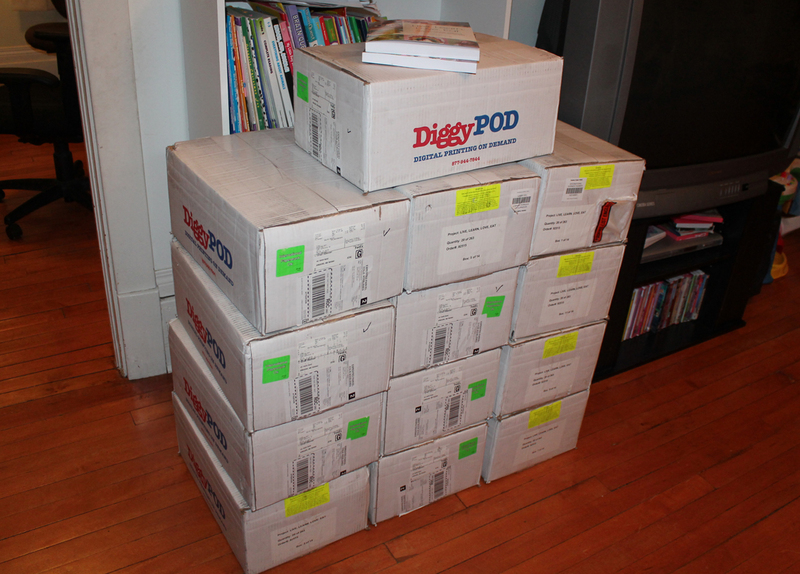 When the phone call came this morning that the books were on their way to our doorstep, we were all very excited! I am glad that my girls each have a copy of their own too so that they can make all of their favorite recipes that we make together when they are older. 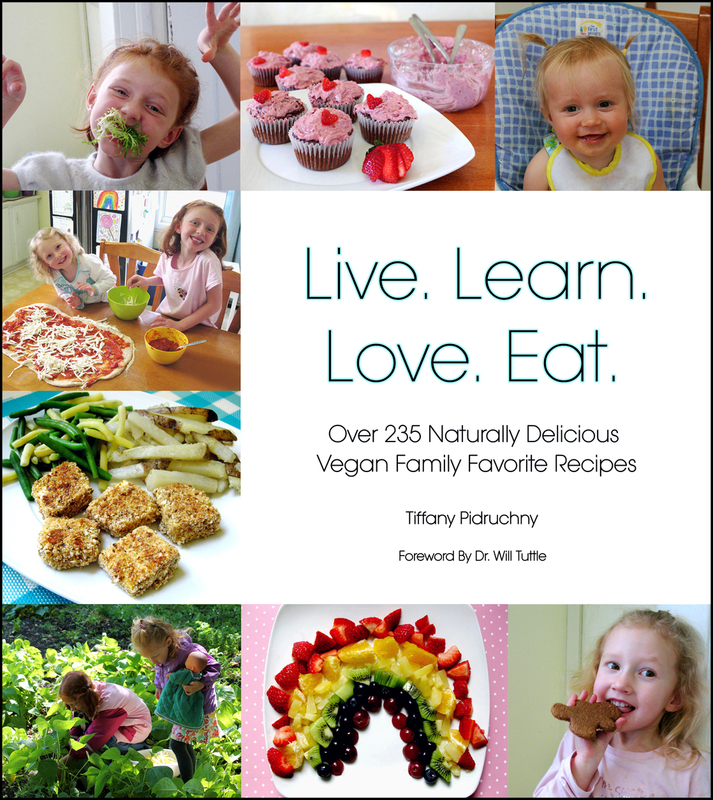 Throughout these pages you will find a collection of our family’s favorite things to eat: Delicious, healthy, plant-strong recipes that have kept us alive and well for the past three years. The inspiration for these recipes was derived from both my old childhood favorites and ideas I thought up for my own children. The ingredients are fairly simple and all recipes are made using healthy, natural ingredients, while still keeping the fun and flavor alive. Each recipe is well-loved by our family and 100% kid-approved. A foreword written by Dr. Will Tuttle, author of The World Peace Diet. A total of 237 delicious recipes – 45 all-new recipes never before seen on the blog. Over 125 mouth-watering color photos of the recipes. A detailed explanation of the vegan ingredients used throughout the book and how to use them. An informative guide to a well-stocked vegan kitchen. A section dedicated to helping those interested in becoming vegan make the switch from animal foods to plant-based ones. Tips on how to get kids to eat healthy. 25 nutritious vegan snack ideas. A handy guide to cooking grains. Suggestions on how to make any meal vegan. Fun, kid-friendly food craft ideas. Since I decided to self-publish and am paying for this all on my own, I have only 250 books to start off with, so order soon to receive your copy! I will be printing the books on demand, so as I sell more, I will print more. I am taking orders via e-mail. To place your order, send an e-mail to tiffanypidruchny@gmail.com with the number of books you’d like, as well as the shipping address. The cost of the book is $30.00. Shipping and handling costs will be calculated after the address has been given. After your order has been placed, you will receive an invoice and have the option to pay via money order, or through PayPal. 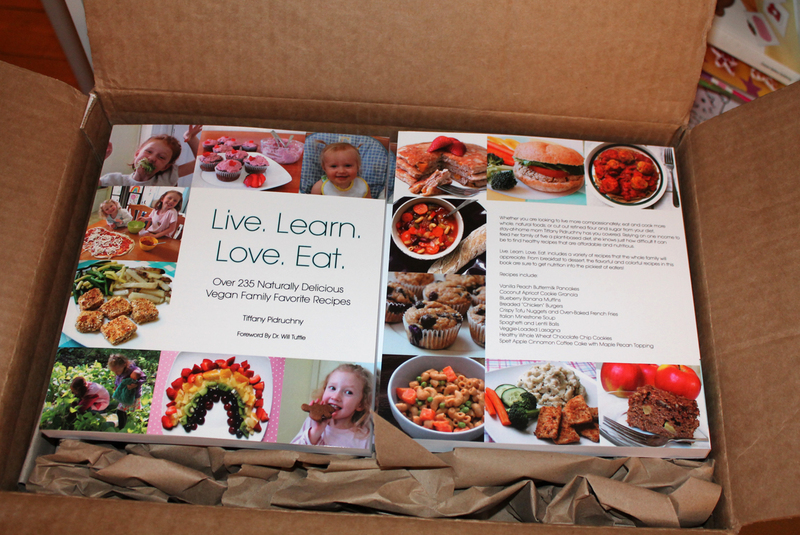 Whether you are looking to live more compassionately; eat and cook more whole, natural foods for yourself or your family; or cut out refined flour or sugar from your diet, my hope is that this book will inspire you along your own journey to health and wellness. Wow, you did it! So proud of you. The book looks great. I can’t wait to get a copy so I can start making all those delicious recipes myself. What an accomplishment, Tiffany! It looks beautiful! Congratulations!! Congrats!!! What an amazing accomplishment! Congratulations, looks great! Just found your blog today, I’m looking forward to taking a peek into your archives! This book looks great! Is there an electronic version available for purchase? Congrats!! You amazing person, you! The book looks great. Beautiful pictures! I will share with everyone! Congratulations Tiffany! I’m so excited for you, and will be ordering my copy soon! Congratulations, Tiffany! I am so happy for you!! Congratulations! You must be thrilled! I love the cover. Oh wow … I’m so excited for you! CONGRATULATIONS!!! I have adored your recipes for so long … I’m just thrilled that you have a book for sale! 🙂 I’m off to share the news with my friends! How exciting!! Congratulations! That is so special to think of your girls cooking from your cookbook when they’re older. There’s nothing like a taste of home when you’re away at college or have moved to a new town. So awesome and exciting! Congrats!!! Congratulations! I just stumbled on your blog tonight and am love, love, loving it! Once upon a time, I was vegan, then I slacked off and went lacto ovo but recently one of my teens issued a challenge. He wondered what it would be like to be vegetarian. I’ve never forced the issue with my kids, and especially since this “son” of mine only recently found his home with us, I hadn’t even broached the subject with him. So we took the challenge. The kids have gone vegetarian and I’ve returned to vegan for the next 30 days. I wish I’d come upon your book sooner. The 1st 2 days I completely freaked everyone out and might have blown my chances of winning them over, but we’re hanging in there. I’d love to see them go vegan. I’ll definitely order your book soon. Did you ever consider approaching Amazon for ebook publishing? I have friends that publish novels that way. It would be great to have this book in e format! Thank you! 🙂 I hope that you will find some recipes and inspiration here. For now, I am just selling my hard copies of the book that I got printed up. Perhaps one day I will make it into an ebook too.